The ‘Coligny Calendar’ from the 1st century BC, inscribed in Latin and written in Gaulish, is the earliest known recording of yearly dates in the Celtic world. It starts at the Full Moon in each of 13 months and comprises of a 30-year cycle with 5 cycles of 62 lunar months. In the Celtic tradition the day began at dusk as the Moon came out. The ancient Irish women knew instinctively that night time was feminine and they saw her as the Star of womenfolk reflecting the penetrating light of the Sun in her waxing and waning glory. The Moon simply ‘is’. Her strength and inner power lie in the stillness of a quiet centre, mirroring nurturing and loving feminine ways. If as women we take the time to be the best we can be holistically, we will then be in a good place to weave that into the world through our relationships: our menfolk, partnerships, families, friendships, workplaces and communities. 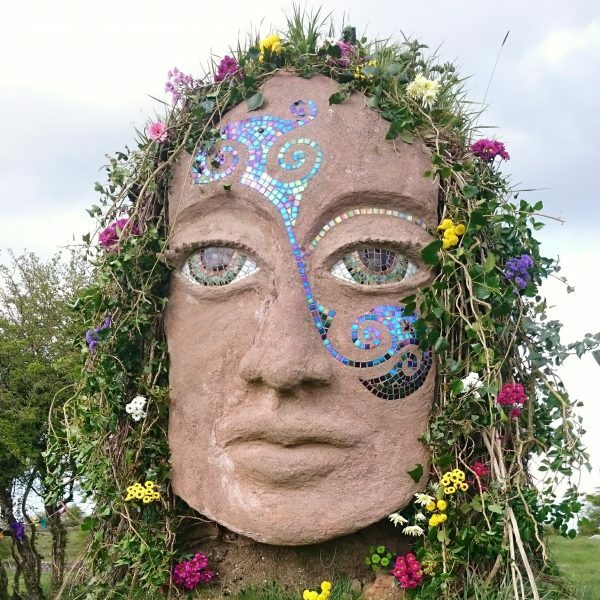 ‘Seanmháthair Gealach’ (pronounced ‘Shan-wa-her Gee-al-yack) as she is known in the Gaelic Irish language, meaning Grandmother Moon, has the power to turn the tides on our planet and her monthly cycle echoes womens from puberty to menopause. The Moon’s many phases may inspire us to know the wisdom of our own natural rhythms and embrace the gifts these cycles have to offer us. When we go with this flow - our struggles become less and we enter a wiser, more grounded, brighter and lighter space. It takes just over 28 days for the Moon to circle completely around the Earth in a full Lunar cycle. During this time, there are five distinct phases: Dark Moon (not visible), New Moon (Crescent), Half Moon (first quarter), Full Moon, then Half Moon (last quarter). This orbital journey takes a little less than a full month, the same time as our monthly menstruation cycle which is why women often refer to our ‘Moon time’ when we have our monthly bleed. Depending on the exact number of days in each month, the Full Moon occurs a day or two earlier each time. Each phase occurs at very specific times and are measured by both luminosity and the orbital path around Earth. The Full Moon reflects a time when we too may want to express ourselves fully, being visible in the world connecting with others, our energy extended outwards. As the Moon journeys from fullness to darkness we may felt the need to go inwards and wish to be alone, to rest and dream anew. All aspects are equally needed allowing us time to nurture ourselves and zing with energy whenever we feel like it, embracing our natural rhythms. As the Moon is close to the Earth her strong gravitational pull affects all water not just the oceans but within plants and our human bodies too. ‘Spring tides’, the strongest, occur when the Sun and Moon pull from opposite sides of the Earth at Full Moon and also at New Moon when they are on the same side. Since our bodies contain approximately 70% water no wonder she affects our moods! Lunar planting is an ancient agricultural practise based on the gravitational pull of the Moon. In the same way that tides are affected, moisture rises in the ground especially at Full Moon time when it peaks. Ute York has written a wonderful book called ‘Living by the Moon’ and she advocates doing ‘all activities with plants that bear fruit above ground during a waxing Moon when the sap rises.’ Then as the Moon wanes and the sap gravitates towards the roots, focus on pruning, fertilising and harvesting. As the Moon moves through the 12 astrological zodiac signs, these too influence plants and crops i.e. the water signs of Cancer and Pisces are considered best to plant seeds whereas root vegetables prefer earth signs such as Taurus. Learn more at the excellent www.gardeningbythemoon.com. The art and science of Astrology explores our personality and daily activity in relation to the position of the Sun and the Moon. The zodiac is a designated area of the sky that extends 8 degrees north or south of the ecliptic path of the Sun over the course of a year. The Moon and planets are also included within the belt of the zodiac which is divided into twelve signs, each occupying 30 degrees of celestial longitude. These correspond to the star constellations of Aries, Taurus, Gemini, Cancer, Leo, Virgo, Libra, Scorpio, Sagittarius, Capricorn, Aquarius and Pisces. Your sun sign which influences your personality is the zodiac constellation at the time of your birth and your moon sign, where the moon was when you were born, shapes your emotions and affects your personality traits. The Moon moves quickly around the zodiac, taking one month to visit all signs staying in each for approximately two-days charging herself with the power and qualities of that sign. www.cafeastrology.com is a free website to find out your moon sign and the significance in your life. May we bask in her beautiful Moonlight, as we honour ourselves and our monthly cycle of life. Her new book the beautiful Moon Mná Diary-Journal has just been released and makes a gorgeous Christmas gift @ €20.00 plus p & p.
Order from www.moonmna.ie or Facebook: Moon Mná –Women’s Celtic Circle.